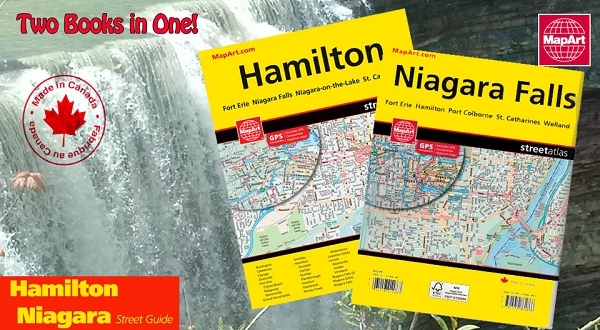 The 2018 MapArt Hamilton Niagara Street Atlas and Map Guide. Beautifully updated street/road Atlas that includes the Hamilton and Niagara region (including Buffalo USA) in both stunning street level detail and a fully functioning 1:250,000 back road atlas that is GPS compatible! Fun travel features include a Wineries listing, Points of interest, camp grounds, boat launches and more!